It's hard to believe it's been almost a year since I was inspired by this lovely cake over at My New Roots and created this gorgeous Clementine Chia cake for my birthday. But it has been and in just a few days I'll be another year older. Last year I was super excited to be making my own cake with my beautiful new Ankarsrum Assistant and I can say none of the shine has worn off working with that beautiful machine, even though so far this year I've been baking and creating at a much slower pace. I'm not sure if I'll bake my own cake this year or not, but looking over these photos I am definitely getting tempted to give this another shot, or see if I can make something that surpasses it in prettiness. ow it would be my wholehearted advice that in most cases this would be a very bad question to pose. But my husband knows me well, after all I did opt to make our wedding cake, and because last year I actually did want to make my own cake. Last year I was very much caught up in the excitement of having a new toy to do all kinds of fancy things in my kitchen like make my own almond butter and even sausages, giving me more scope to explore flavours and textures when I create my own recipes. And that question has very much paid off in the past, my tastes being a bit particular, I'm not into the hyper sugary synthetic flavours found in a box cake, which though talented in many other areas is very much the limit of my husbands' cake baking abilities. So between that lovely new machine, my fussy tastes and a desire to use Clementines I produced this pretty and fragrantly delightful birthday cake. In the next few days I'll decide what the answer to that question is this year, but for now let's enjoy indulging in last years' bounty. *that is unless they're asking someone with an overblown passion for food and possibly blogging that food. Place all dry ingredients (except panela, chia seeds and pistachios) into a medium mixing bowl and whisk until well combined. In a large mixing bowl, add the almond butter, clementine juice, panela and oil while whisking. Whisk until smooth. Gently fold in dry ingredients until just combined. Pour half of the batter into the lined prepared pan, flatten, then sprinkle with the chia seeds completely covering the batter. Add the remaining batter on top. Place in the oven for 45 minutes to an hour until golden on top and a toothpick inserted into the middle comes out clean. Let cool for 10-15 minutes before removing from pan. While the cake is cooling, put all the syrup ingredients together in a small saucepan on the stove. Warm up on very low heat and stir often (do not let it boil). Once the syrup is well combined, remove from heat until ready to use. Toast the pistachios in a dry skillet over medium-high until they are fragrant. Remove from skillet to cool. Set aside. When cooled roughly chop pistachio nuts. Once you have removed the cake from the pan, slice off the uneven top of the cake so that when you invert it, you’ll have an even bottom. With the bottom of the cake now facing up, poke several holes in the top with a skewer. 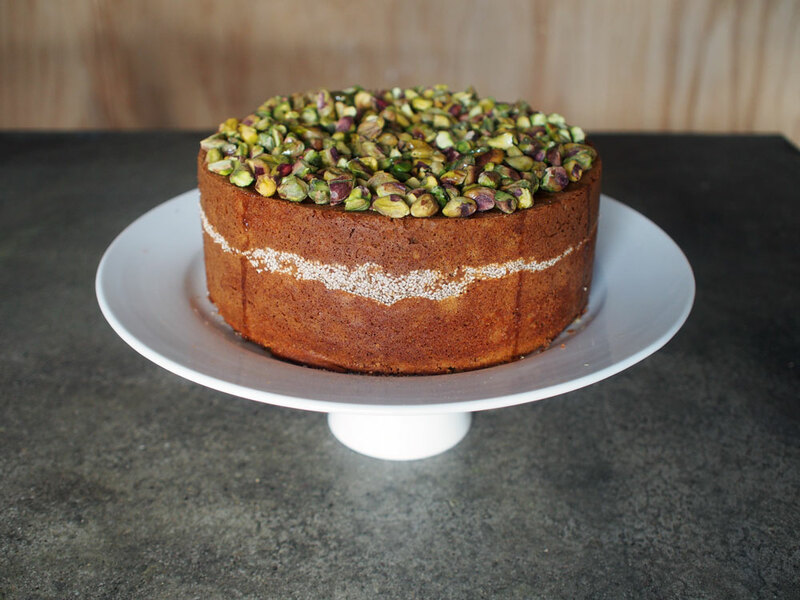 Cover the cake top with the pistachio nuts and pour the warm syrup over top. With a nice cup of coffee, on a porch in the sun wearing headphones so you can't hear the kids nagging for a slice. Tell me what's been happening in your kitchen?